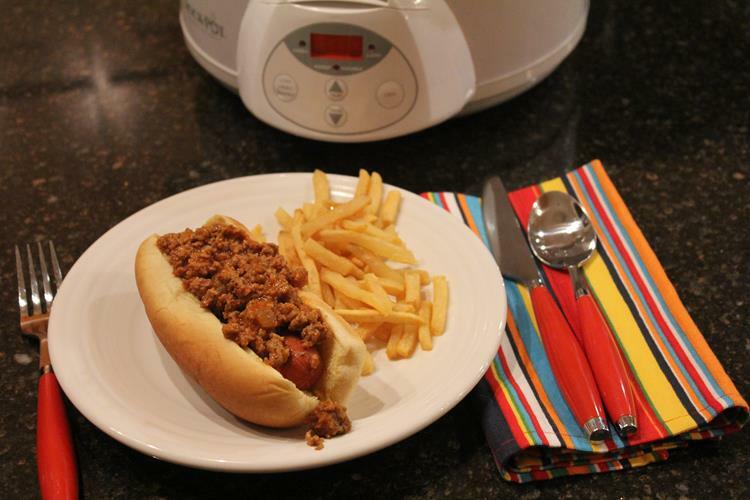 Slow Cooked Coney Dogs are a simple meal that kids will love! There was much debate at my house about whether or not I should share this recipe with you. Not that it isn’t a great recipe, it is, it was more like it was not a fancy enough recipe. Now I am not about fancy. If you have read my site for long you know that, so I thought one of my kids comments about the meal not being “nice” enough was funny. 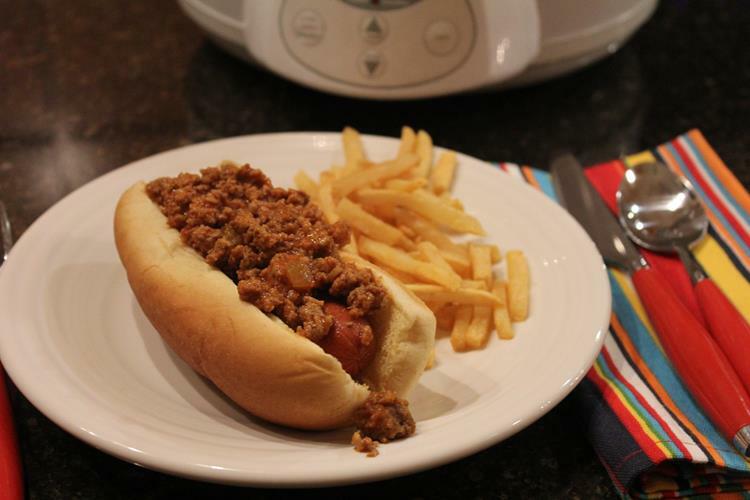 My meals are never fancy, but I guess coney dogs seems really plain to my kids. I knew I had to share this recipe because it is perfect for kids. Most kids love hot dogs. And most kids and adults love chili. Combine the two and you have a simple and delicious lunch or dinner that kids and teens will love. This is one of those recipes that I know is not fancy. It is also something I probably would not cook all the time, but for kids and teens it is perfect. This recipe is great because you can make it ahead, put it in the crock pot, and let it cook until you are ready for it. This would be a simple and easy meal for a kids party or a group of teens. I have three teens. Teens are always hungry. This is a simple meal that if you double or add in some extra hot dogs could serve a lot of kids. That is why I knew I had to share this for my Cooking Through My Collection series. This will be a recipe I know some of you will love. I know I will be making it again! 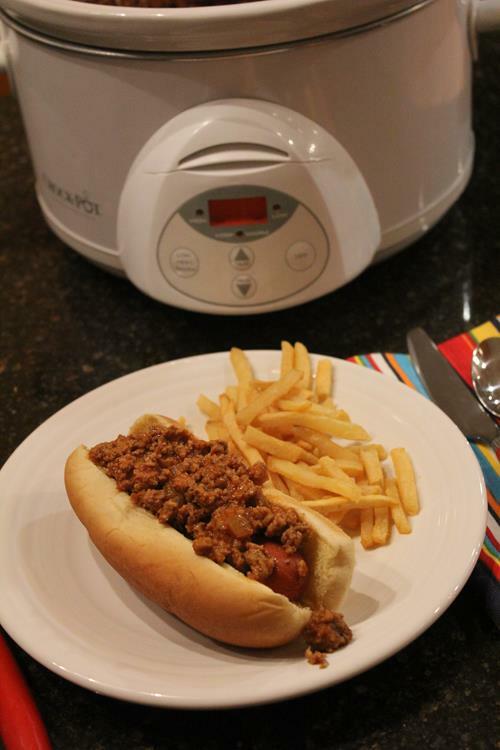 The recipe comes from the cookbook Fix-It and Forget-It Slow Cooker Magic . I have several of the Fix It and Forget It cookbooks. I like them, but will admit that a lot of the recipes use canned soups and mixes that I don’t buy. However, I am still able to fine quite a few recipes in the books that we use and love. I really like this Fix-It and Forget-It Slow Cooker Magic . I will say though that a lot of the recipes seem the same or very similar to the recipes in previous books. So, if you own the other cookbooks you might feel like there is a lot of repetition. However if you don’t own any of the other cookbooks and are looking for some new slow cooker recipes I think you will enjoy this cookbook or one of the other Fix It and Forget It cookbooks. Now for the recipe. I did change this up slightly. I increased the amount of ground beef. I also left the hot dogs whole. The recipe said to cut the hot dogs up and serve on rolls or pasta. I left them whole and served them in regular hot dog buns, but you could easily cut them up if you prefer. hot dog buns, cheese, etc for serving. In a skillet brown ground beef with onions until beef is browned and onions are tender. Drain off any fat and place in a slow cooker. Add in garlic, chili powder, mustard, tomato sauce, and water. Stir well. Add hot dogs and stir. Serve on buns with shredded cheese or desired toppings. Note: Those that are gluten free in my family just ate it without the buns or ate it on gluten free bread. The coney dog recipe looks good. I’m going to have to make it. Your gluten free recipes are awesome. Thank you I am glad you enjoy my gluten free recipes. I love sharing how gluten free can be quick, easy, and delicious!